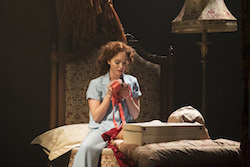 Ashley Shaw as Victoria Page in 'The Red Shoes'. Photo by Johan Persson. New York City Center, New York, New York. Ashley Shaw as Victoria Page in ‘The Red Shoes’. Photo by Johan Persson. The Red Shoes came into existence nearly 70 years ago, when it debuted on the silver screen in 1948. British audiences loved it and its stars, making it one of the most popular British films of all time. The Americans followed suit several years later. 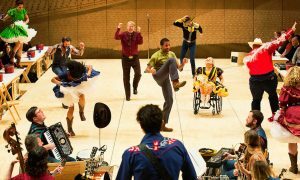 Surely its success is largely due to the talent of its cast, which the producers wisely chose to make up of dancers who could act rather than actors who could dance. Those stars were some of the biggest names in ballet at the time and are still easily recognizable as influential figures in recent ballet history. The film stared British ballerina Moira Shearer and featured Robert Helpmann, who also choreographed for the film, and world renowned danseur and choreographer Léonide Massine. This fall, New Adventures’ production of The Red Shoes, choreographed by Matthew Bourne, toured in the U.K. and USA to much acclaim. 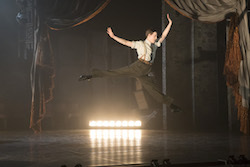 The show, which starred Ashley Shaw as ballerina Victoria Page and Dominic North as composer Julian Craster, on opening night at New York City Center, largely followed the same storylines as the film. 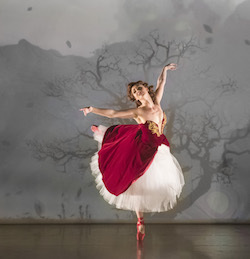 The plot centers around a ballet, aptly named “The Red Shoes” based off a tale popularized by Hans Christian Anderson, and the relationships the company dancers develop in parallel to it and as a reflection of it. The film and Bourne’s production set the ballet within the context of a world-famous ballet company, whose new and prodigious composer, Julian Craster, creates the score, and for which the lead role is to be performed by the company’s ingenue, the young Victoria Page. 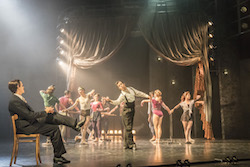 The company’s impresario, who is said to have been loosely based on Ballets Russe de Monte Carlo’s Serge Diaghilev, replaces his aging star with the breathtaking Vicky, who quickly rises to stardom. However, as Vicky and the composer find success, and fall madly in love, the impresario is overtaken by jealous rage, firing the composer. Vicky leaves the company and the world of ballet to follow her love. Dominic North as Julian Craster in ‘The Red Shoes’. Photo by Johan Persson. What ensues is a classic ending, dictated by outdated mores of what a woman is supposed to do and can do when faced with following her passions. Bourne’s production does not stray from this to update the story. We do not quite get the story of a modern woman’s choices; if it had, we wouldn’t be touched by so tragic a fate for our young heroine. But we can still deeply relate to fighting for the balance of fulfillment in life, and the maddening consequences of our inability to hold onto it. The first part of the New Adventures production is filled with overt and comedic character acting from the entire cast. Michaela Meazza and Liam Mower were brilliantly dreadful as the company’s aging lead dancers. It becomes quickly clear that this part of the show is not about the dancing per se; in fact, a lot of what we see is skillfully awful as we learn how shallow some of these characters really are. As amazing as the acting is, it amounts to watching bad dancing for much of the first half of the show. Thus, the comedy is spot on while the desire to see actual skilled dancing is left unsatisfied. Sam Archer as Boris Lermontov and The Company in ‘The Red Shoes’. Photo by Johan Persson. Much of the movement led me to question if I just don’t like Bourne’s choreographic style that much or if it’s really that it wasn’t particularly effective for me with this score. Interestingly, it was Bourne and his orchestrator Terry Davies who constructed the score out of music originally composed for films by Bernard Herrmann in the 1940s-60s. The score was satisfying, appropriate for every scene and totally harnessing everything that made movie music orchestral magic. I haven’t seen nearly enough of Bourne’s work to comment on it. But here, it generally lacked syncopation and rhythmic contrast relative to the music, and movement relative to itself, which is frustrating considering how beautifully timed and structured all of his staging and character work was. It’s as if most of his wit was used up on the theatrical elements. The ballet within the ballet, however, which closes the first act, was beautifully choreographed and designed, and was consequently by far the most exciting and compellingly choreographed section in the show. 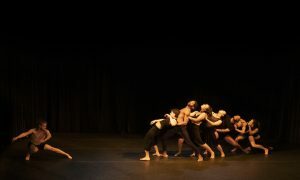 The set design was simple white panels of multiple depths that allowed amazing projections designed by Duncan McLean, to create atmospheric drama that beautifully supported the dancing to powerful effect. Ashley Shaw as Vicky showed freedom and life in all of her dancing, and in the ballet, her dancing shone its brightest, overflowing with the strength and elegance of her character. The corps looked its absolute best here, showing off movement reminiscent of the jazzy movie musicals in the Red Shoes era, low slung hips, sloping shoulders, and cool before cute. Here we see them at the height of performance. The other choreographic highlight of the show? The short Egyptian vaudeville act that opens the scene in East End, London, where Victoria and Julian are trying to find work in crummy dance halls, and failing. From the costumes to the set, the entire performance had incredible production value. Bourne and Associate Designer Lez Brotherston, who also designed those compelling costumes, made fantastic use of a single massive curtain, the main set piece, which was particularly stunning and brilliantly simple. 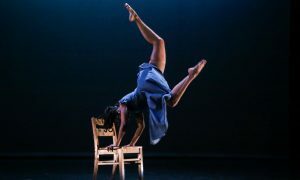 It was rotated to change perspectives, allowing the audience to feel like they are watching from the wings or on stage with the dancers themselves, and opened or closed to reveal new scenes. And every scene was enhanced by masterful lighting design by Paule Constable. 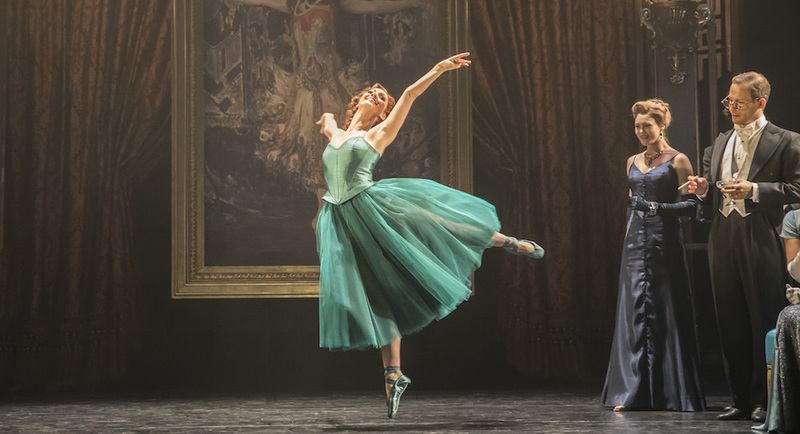 The magic of The Red Shoes has been brought to the stage in dramatic fashion, but don’t skip the film if you want to see all that is encapsulated in this haunting story. Can dancers have work-life balance?